That's a rather diverse array of uses for a single sensor. We all know now that our health depends on getting up and walking around every so often. But when? And how often? A new sensor from Humanscale and Tome will tell you, with an app. The OfficeIQ sensor will appear inside convertible standing desks from Humanscale, according to Chris Gibson, Humanscale’s vice president of marketing. But what’s interesting is that they’ll be sold separately, at about $125 a pop. (The desks themselves cost about $1,000 or so.) That will allow them to be connected to existing convertible desks that lack any analytical functions. Gibson found that, disappointingly, a significant number of its customers weren’t using their convertible furniture to full advantage—they were dropping their desks to a seated position and leaving them there. The company decided to do something about it. 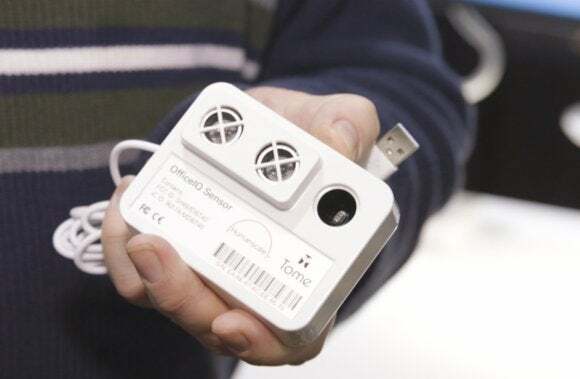 The OfficeIQ sensor connects to either a Web app or one on your smartphone, reporting back when it’s time to get up and stretch, or when it’s time to enjoy a well-deserved rest. Not surprisingly, the app tracks your progress over time, and also reports back the positive aspects of your choices—how many calories you’ve burned, for example. Humanscale hopes that IT and HR departments can begin tapping that information—not to spy on employees, but to negotiate special discounts with insurance providers, Gibson said. There’s also an intriguing side benefit: the sensors can be built into the casters of rolling chairs, such as those that are used in a conference room. Rather than wonder if a room is booked, one with the Humanscale connected chairs can know—instantly. It might not eliminate the confusion surrounding scheduling conference rooms, but it will at least allow other workers if one is available.